Picture it, Tokyo, 2042. You’re sitting in your apartment watching a breaking-news story about a murder; then the scene switches to a live feed from inside the alleged killer’s residence as the police prepare to make the arrest. Oh, it just so happens to be YOUR residence! Desperate to clear your name, you do what any rational person would do – you let your friend turn you into an assassin for hire. At least, that’s what SMAC Games and Mode 7 have you doing in their intriguing open-world action game, Tokyo 42. With each job, you’ll earn the trust of various elements of Tokyo, each one adding another piece to the puzzle of just what is happening to you, all while the police and rival assassins are nipping at your heels. Fortunately, you have stealth on your side, as well as the ability to change your appearance practically at will, enough to shake off a tail. When you do get time to breathe, mid-21st-century Tokyo is a site very easy on the eyes, unlike most dystopian-future interpretations. Beautiful style – Rarely has a future been rendered quite so colorfully. 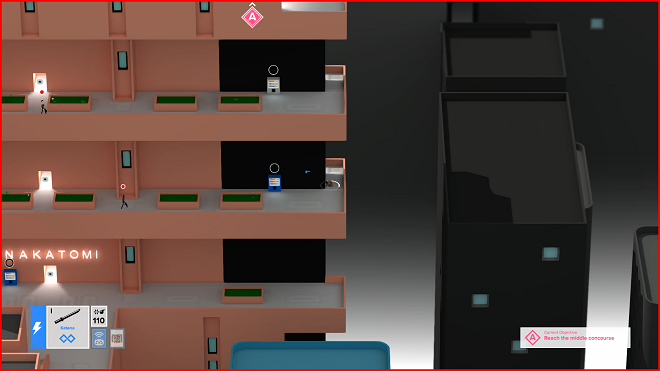 Tokyo 42 uses an “in the clouds” format that establishes your boundaries appropriately. Your isometric viewpoint can be rotated at 45-degree increments using the Bumpers, giving you a full view of your surroundings. Those surroundings are a mix of Day-Glo and pastels that are a welcome change-of-pace for this style of game. The city is very much alive, with passers-by who are going about their business, and who scurry around randomly in the middle of a firefight between your character and your rivals before returning to that business. Explore at your pace – As quickly as you want to get your life back to normal, there really isn’t a sense that you need to be in a particular hurry to get things done. Most missions allow you to take your time, setting up your opponents in the way that fits your own style. Enter with guns blazing or as silent as a ninja, whichever works for you or for that particular job. The more your reputation grows, the more your list of available jobs will grow, which you can take in almost any order you choose; jobs directly related to the story are linear, however. If you’re so inclined, take a breather and explore the city, looking for collectibles to pick up or unique sights to tag using your always-available binoculars. 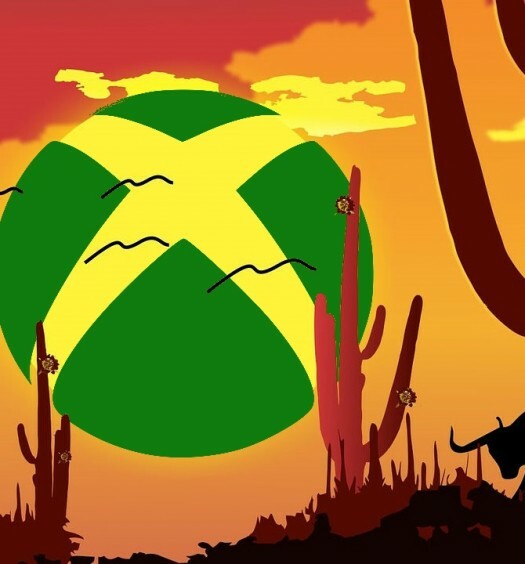 While this is hardly unusual, the game’s style and presentation gives players a reason to check out the surroundings, even to the exclusion of their primary missions. Super-powerful, with limits – One of the conceits of Tokyo 42 is that death is not that big of a deal. Thanks to a mysterious pharmaceutical company called NanoMed, fatal wounds are no longer fatal. This same company gives you the ability to change your entire appearance (thus making it easier to avoid detection after a hit), survive a fall from almost any height or teleport around the city. 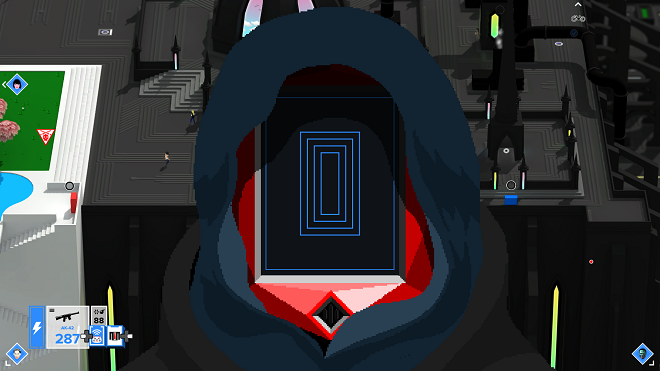 However, it’s not infallible: you still have to get clear of the scene of the crime, and your ability to change appearance is limited by a battery meter; you can’t survive a fall out of the world; and you can’t teleport while you are actively being tracked, nor can you teleport to a location you have yet to visit physically. These and other abilities give the player powerful tools but rein them in properly to keep it challenging. Got magnifying glass? – I was recently introduced to the term “ant-farm view,” used to refer to a cutaway look into the game world (specifically, Fallout Shelter). 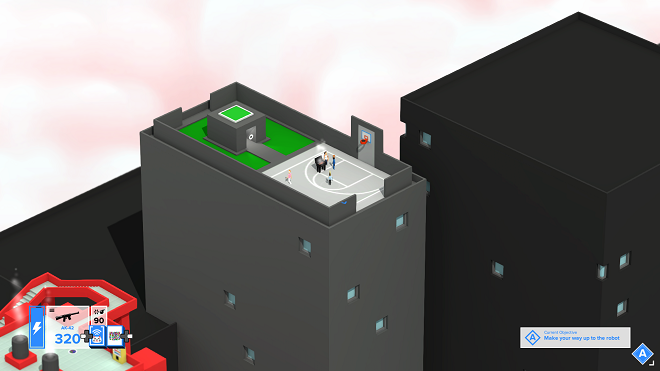 A similar term could be coined for Tokyo 42, that of “ant view.” Your characters and the NPCs are incredibly tiny, especially on a large media-room TV that you probably have your console connected to. The details offered by the various collectibles (such as new colors for weapons) are reduced to a mere handful of pixels, almost making them pointless unless you’re achievement-hunting. Combat mechanics – In close-quarters combat, the game behaves very much like a twin-stick shooter. The player points Right Stick in the direction of fire and pulls Right Trigger. When range increases, or it changes from one to the other, problems start occurring. Clicking Right Stick will toggle on a long-range mechanic where you move Right Stick to the target point. It’s great for sniping, but not so great if you get flushed out, or enemies close in on you quickly, which tends to happen a lot. Related to this is your supply of grenades, which are mapped to Left Trigger. The simple fire is a short-range lob, but you can click Right Stick again to open up the long-range targeting. As soon as the grenade is launched, the toggle remains in place for your melee/ranged weapon. This makes mixed firearms tactics much harder to pull off. For the record, I’m not a huge fan of crime simulators like Grand Theft Auto V, so this game is out of my usual comfort zone. With that confession out of the way, SMAC Games has turned out a fun adventure that, despite the issues I have with its gameplay, keeps me wanting more. Tokyo 42 has found an unexpected fan in me, and if you give it a chance, it just may find one in you, as well. 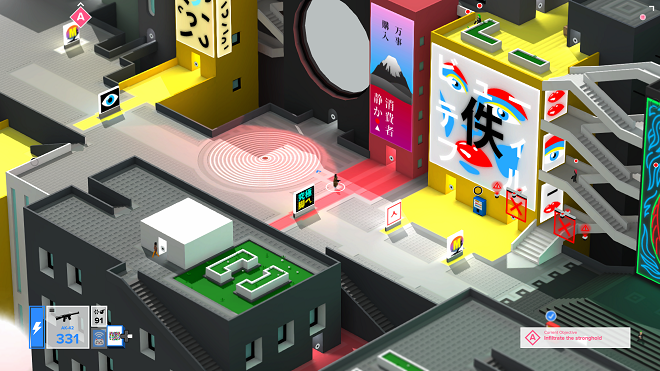 Tokyo 42 was developed by SMAC Games and published by Mode 7 Limited. It was released on May 31, 2017, for $19.99. A copy was provided for review purposes.